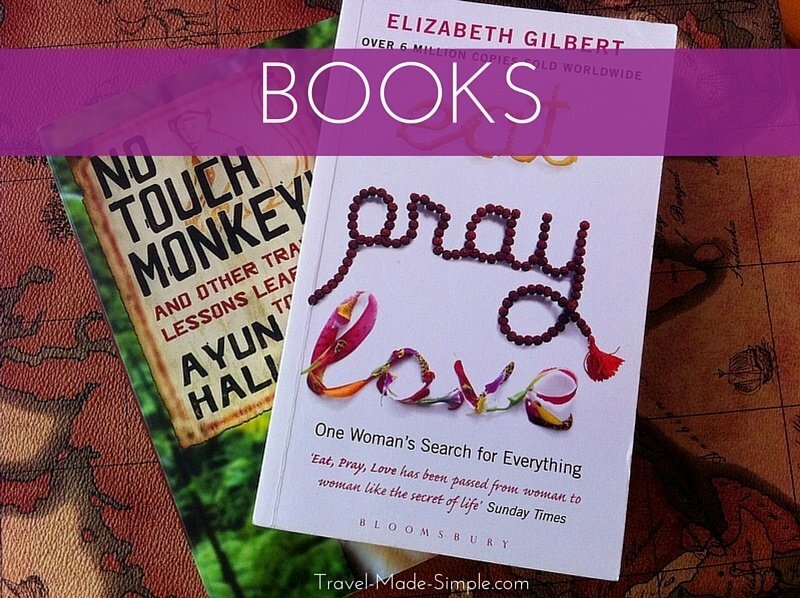 The books section has travel-related books to help inspire as well as plan your trips. You’ll find reviews of unique guidebooks, travel memoirs, and other books I think are useful, thought provoking, or simply fun to read. Unconventional Guidebooks: This is a guidebooks series written by Gigi Griffis. In each guide, she has interviewed locals who live there and who share their insider tips about where to go, what to eat, and how to fit in. It’s like having a best friend show you around. You can purchase the full color PDF versions of her books here. Read more about the guidebooks here and here. The Ultimate Guide to Australia Itineraries: If you’re trying to plan a trip to Australia, this guidebook is for you. Written by Michela Fantinel, an Australia expert, she tells you how to plan the perfect adventure in the land down under. You’ll get a realistic view of what you can see in the amount of time you have, tips for customizing your dream vacation, and more. Read more about the book here. What the Florida? A One Weird Globe Guidebook: Skip Disney and Universal, and explore Florida’s quirky side. Did you know there’s a museum of Tupperware in Florida? And a candy store started by the guy who invented Jelly Belly? This guidebook will show you how to visit over 90 quirky attractions in Florida so you can get off the beaten path and see something unique on vacation. How to Find the Perfect Vacation Rental: Renting an apartment instead of staying in a hotel can be a great way to save money, have more space, and get a different perspective on your vacation destination. In her book, Gillian Duffy walks you through all the different things to look for, where to look for apartment rentals, and how to make the most of this alternative accommodation option. Read more about the book here. Guide to Obtaining Visas for US Citizens: Visa rules vary greatly from one country to the next, and it can get confusing really quickly. Talon Windwalker put together this helpful guide detailing tourist visa rules for every country in the world, plus lots more helpful information about safety, traveling with children, and other requirements certain countries have for entry. Since rules also vary depending on the citizenship of the traveler, this book focuses on US citizens. Read more about the book here. How Not to Travel the World: In her hilarious memoir, Lauren Juliff tells how she was crippled by extreme anxiety but decided to travel the world anyway. She has one disastrous incident after another but keeps on going. This is an entertaining book and a great read for anyone battling travel fears. Read more about the book here. No Touch Monkey! And other travel lessons learned too late: This hilarious memoir by Ayun Halliday spans several decades of her life and takes you on a journey through many countries. Some of her experiences will inspire you to get out there and see the world, while others will make you laugh and cringe and feel thankful they happened to someone else. Read more about the book here. Eat Pray Love: The famous memoir by Elizabeth Gilbert takes you through her journey of self-discovery through Italy, India, and Indonesia. Wild: From Lost to Found on the Pacific Crest Trail: Cheryl Strayed’s life had fallen apart in every way, so she set off to hike the Pacific Crest Trail. In the process, between the ups and downs, she became whole again. The Longest Way Home: 80s actor turned travel writer Andrew McCarthy writes about his travels leading up to his wedding and how traveling ultimately helped him overcome cold feet. Long Way Round: Actors Ewan McGregor and Charley Boorman decide to ride their motorcycles around the world. They started in England, drove through Europe, Russia, Kazakhstan, Mongolia, Canada and the USA before arriving back where they started. Long Way Down: After driving their motorcycles around the world, Ewan McGregor and Charley Boorman decided go from top to bottom. Starting in Scotland, this time they went south through Europe and Africa. The Turk Who Loved Apples: Matt Gross, former writer of the Frugal Traveler column for the New York Times, has had a lot of travel experience. In this memoir, he has compiled a variety of stories from different points in his life showcasing the high points as well as the mistakes, giving the reader a different perspective on travel. What I was Doing While You Were Breeding: Kristin Newman, sitcom writer for shows such as “How I Met Your Mother,” wasn’t ready to settle down when everyone else around her was, so instead she traveled. The hilarious situations she got herself into entertain the reader throughout the book. Drive Nacho Drive: A Journey from the American Dream to the End of the World: Brad Van Orden and his wife Sheena quit their jobs to drive a VW camper van from their home in Arizona through Central and South America until finally reaching Ushuaia, the southernmost town in the world. Stories of their travel experiences and frustrating van breakdowns hooked me in. 927 Days of Summer: This book picks up where Drive Nacho Drive left off. Brad and Sheena shipped their van from Argentina to Malaysia and continued the overland (and occasionally by boat) journey through parts of Asia, Europe, and Morocco. The Lost Girls: Three Friends. Four Continents. One Unconventional Detour Around the World. : Three friends quit their jobs to travel around the world. The journey shapes their friendship and who they become as individuals. Fast Times in Palestine: This is the heart-breaking story of Palestine the media doesn’t talk about. Pamela Olson ends up visiting Palestine after a chance encounter, and she ends up moving there. She tells of the relationship between Palestine and Israel and how there are two, if not more, sides to every story. Avoiding Prison and Other Noble Vacation Goals: Wendy Dale, a woman leading an unconventional life, tells an entertaining story of travel, taking risks, and making decisions I could never imagine facing. The Good Girl’s Guide to Getting Lost: Rachel Friedman, always the good girl who plays it safe, surprises everyone including herself when she buys a ticket to Ireland. That trip, and the close friend she makes while there, leads to travel adventures on three continents, and eventually she starts to embrace living in the moment. Honeymoon with My Brother: Franz Wisner’s fiancée dumps him just days before their wedding. He ends up taking his brother on the honeymoon to Costa Rica, and during their trip, they hatch a plan to quit their jobs and spend a year traveling. Aside from the travel adventures, this is a story of two brothers, who didn’t know each other well before the trip, bonding and strengthening their relationship. How the World Makes Love…And What It Taught a Jilted Groom: A follow-up to Honeymoon with My Brother, this time the brothers set out to explore the idea of love through the perspectives of other countries. Happier Than a Billionaire: In these two books, Nadine Pisani tells the hilarious story of how she and her husband moved to Costa Rica and all the hurdles they had to overcome along the way. The Poisonwood Bible: This is the only one on my list that’s fiction. It’s the fascinating story of a preacher and his family who move to the Congo on a church mission. Each chapter is told from the perspective of one of the four daughters and follows them from childhood to adulthood, showing how that time forever changed their lives. One of my all-time favorite books, and while not exactly a travel book, the setting in the Congo is like another character. Nothing to Envy: Ordinary Lives in North Korea: Barbara Demick follows the lives of six North Korean citizens over fifteen years, telling us their stories of struggle and survival. The Great Leader and the Fighter Pilot: In this book, Blaine Harden tells the amazing parallel stories of North Korea’s tyrannical leader and a fighter pilot who stole a plane in order to reach freedom. Without You There is No Us: Suki Kim, a Korean-American journalist, poses as a teacher to gain access to the reclusive North Korea. She teaches the sons of North Korea’s elite and learns a great deal about the difficulties of life there. Dear Leader: My Escape From North Korea: While most stories of North Koreans who have escaped are told by those of the lower class, this story is told by Jang Jin-sung, former poet laureate to Kim Jong-il. He was part of the elite, but he made one wrong move and had to escape. This was a fascinating look at a different part of North Korean society and the harrowing journey this man made to reach freedom. Cuba Diaries: An American Housewife in Havana: When Isadora Tattlin and her husband moved to Havana, Cuba for his job in the early 1990s, she kept a detailed diary of her experiences in this country of contradictions and extremes. Undress Me in the Temple of Heaven: In 1986, Susan Jane Gilman and her friend traveled to China, which had just barely opened up to independent travelers. What started out as a fun adventure turned dramatic, and the girls found themselves in over their heads. Love with a Chance of Drowning: Torre DeRoche meets a handsome man in California, falls in love, and embarks on an adventure at sea…despite her fear of the ocean. All Over the Map: Laura Fraser has just gotten divorced and is about to celebrate her 40th birthday. Her life is not where she wants it to be, and she wonders if it is because of her travels. Through relationships and journeys, she finds her way back to herself. Go Your Own Way: In this collection of short stories, women tell their stories of solo travel. This is sure to inspire you to get out there on your own. Need help planning your trip? Check out the travel resources I love and get closer to your dream vacation.